While some countries have cracked down with harsh regulation on token offerings (we’re looking at you, U.S.), others have worked to become “crypto hubs” of favorable regulatory frameworks and lower taxes. Looking to fill the void left by others, these countries competing for the title of ICO utopia are finding it isn’t bringing the prosperity they had initially hoped for. As the crypto commotion continues, every once in a while it helps to step back and take a macro point of view towards the market in general. Adam Tache does just this, giving overviews and updates for major coin’s upcoming projects. Andreessen Horowitz has embraced the crypto sector in ways no other major U.S. venture-capital firm has done to date. Now it’s adding firepower and capital to its efforts by closing $300 million for a new blockchain-focused fund and hiring Kathryn “Katie” Haun, a former prosecutor with crypto enforcement experience. What’s Wrong with Cryptoasset Valuation Models Today? We’re seeing this story play out in real time – early stage valuations are falling back down to earth. As Ari Paul puts it, all bad things eventually come to an end, and “decent teams with an idea on a napkin” aren’t not getting the funding they did before. Bonus: Here’s a Twitter rant by Nathaniel Whittemore on the subject. This informational essay confirms what most have already suspected. 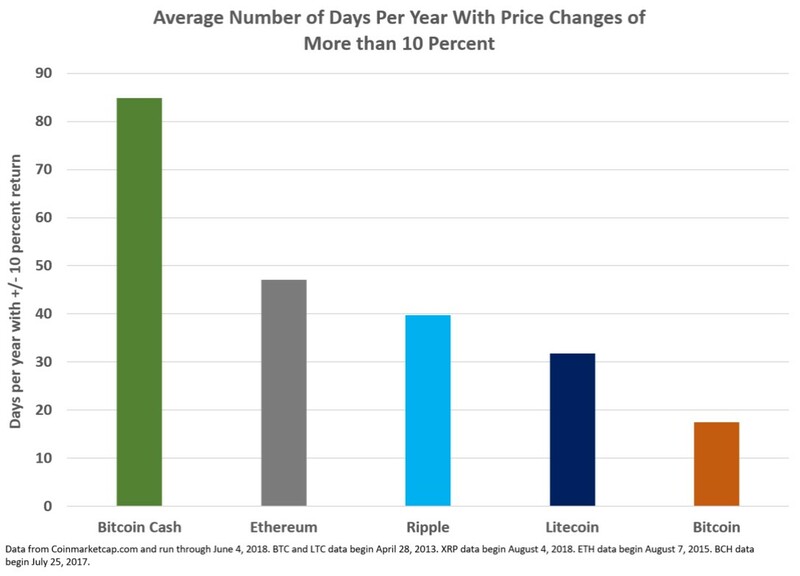 Since Bitcoin is the biggest cryptocurrency and is used as a base cryptocurrency for trading pairs, it will have low volatility in comparison to others. A neat thing about public blockchains and dApps (decentralized applications) is that all of the data about them is actually public. During this exclusive live event, you’ll discover: The real reason why crypto critics on Wall Street are now investing billions of dollars in cryptocurrencies. Plus, you’ll have the chance to claim your share of $1 million in Bitcoin as part of an exclusive giveaway. To get more details register for FREE. Bitcoin prices dropped after several cryptocurrency exchanges in Japan were ordered to fix their security flaws and temporarily suspend account creation. Though the markets seemed to disagree, we argue that this was a GOOD thing! Will the real U.S Government HODLers please stand up? The House Ethics Committee recently passed legislation that require members of Congress possessing cryptocurrency over $1000 to reveal it in their financial disclosure reports. The House Ethics Committee didn’t stop there however, barring lawmakers with prominent salaries from making money through cryptocurrency side gigs. I guess that means we won’t be seeing Ted Cruz hooking up his mining rig anytime soon. Viberate (VIB) seems to have tested and bounced off of the 1070 satoshi line. VIB has been accumulating in a bot-like fashion, which could indicate an averaging down strategy. 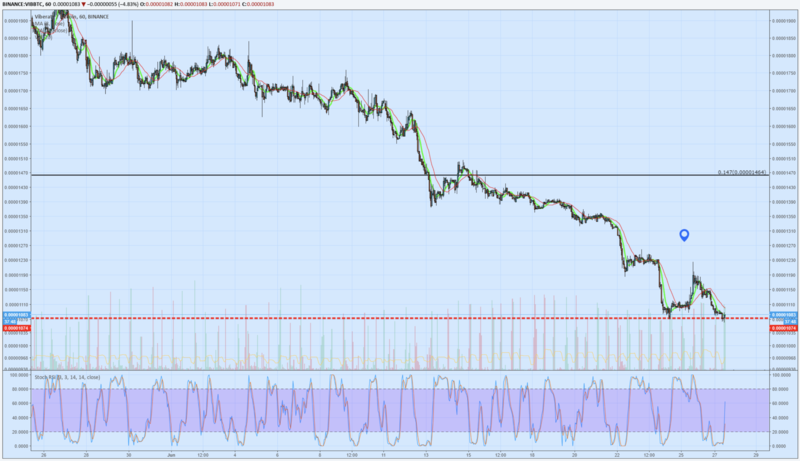 The Stoch RSI has turned around from the bottom pane, which should confirm a double bottom. We have set a tight stop loss should the trend reversal not play out.